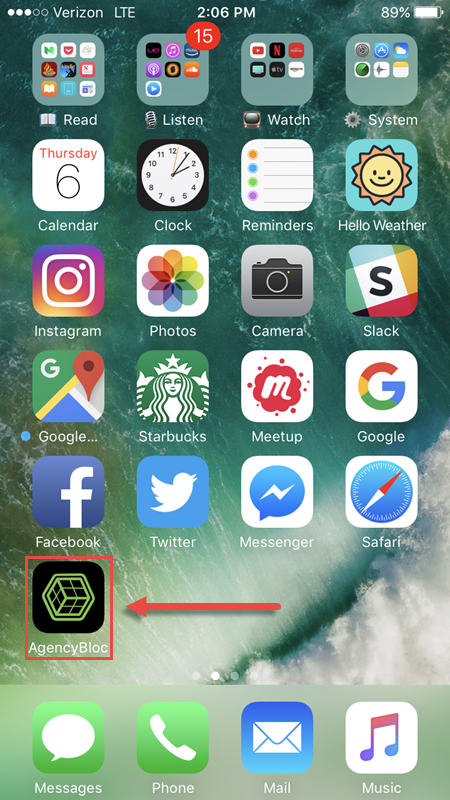 To save time, you can add a shortcut to AgencyBloc to the home screen of your device. AgencyBloc is responsive, which means it adjusts to the size of the screen you use. So, use your mobile device to access AgencyBloc just like you would use an app. Learn how below. Open AgencyBloc account in Google Chrome. Use the menu button and open your bookmarks. Find your bookmark for AgencyBloc, press down and hold. An action menu will appear. Open AgencyBloc in mobile Safari. At the bottom of your screen, tap the middle icon. Tap "Add to Home Screen" button and name the bookmark after your AgencyBloc account. Open AgencyBloc account in Internet Explorer. Tap the three dots in the bottom right corner of the Windows Phone and drag it up to view the options menu.